I have tried all kinds of strategies to deal with the noise level in my classroom, and I find that I am not alone! Kids love to talk, and if you let them, that is all they will do! Below are resources and links to articles about how master teachers solve this problem. Many art teachers find that having quiet work time at the beginning of class really helps students get into a more focused mindset for the rest of class. This can be 5 minutes or 30 minutes, depending on the group and the objectives for the lesson, but it is extremely helpful. Art class is not recess! We want our students to have fun in art, but we also need to teach them that they are in class to learn. Once, I was talking to a classroom teacher about a disruptive elementary student. She explained to me that this student was not disruptive in her class because, "I don't give them time to act up... my class is very structured and students are too busy to get in trouble." I nodded politely, but her statement revealed a common attitude toward art classes; that they are unstructured time for students to play. That is far from the truth! 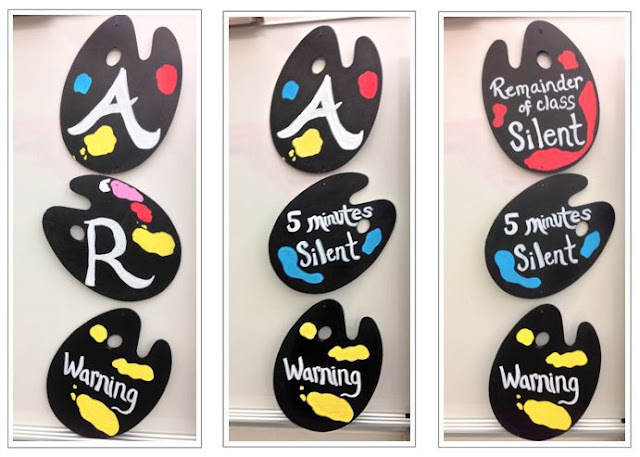 "A" "R" "T" This terrific idea is from Theresa McGee at The Teaching Palette. She has painted, wooden palettes strung together with fishing line. When the class gets too noisy or off-task, she turns over the "T" for a warning. If they continue, she turns over the "R" for 5 minutes of silence, and then finally the "A" for silent art. I tried this in my classroom by writing the letters on the board and erasing them one at a time. I have been delighted with my groups monitoring their OWN noise level. I don't announce it if I erase a letter, the kids do! What would I do if this didn't work? I would implement my discipline plan for students breaking the rules. They were warned! Also, I told mine that if the "A" got turned over the last few minutes of class, Silent Art would carry over to the next day's class. This is a great system, but it will only "work" if you teach the kids first what you are looking for. Role play and demonstrate exactly what you mean by "whisper voice" and "zero talking." VIDEO THE LESSON: Another idea to help manage the talking (especially if you have large classes) is to video your lesson. That way, while the lesson is playing you can watch the kids like a hawk! This method is also terrific for kids who need multiple demonstrations. They can watch your demo over and over! Youtube video: Motivational speaker Eric Thomas goes to Vashon High School where his speech takes an unexpected turn after a group of students will not be quiet after being asked to. He doesn't pull any punches when he tells them how disrespectful their behavior is! Silent art still always works. Mine know if I have "shhhed" them for a while and I say STRIKE ONE…they are on my nerves and if I get to Strike Two it is silent art which they hate. So, its effective if I only say strike one. Master non-verbal cues/communication. Learn how to stop disruptive students with a glance, a hand motion, or just being in their immediate proximity. Have a signal you consistently use to get the whole group’s attention. I count down from 5 while holding up my right hand. I have also used the “Clap once if you can hear my voice” routine which really works wonders if the group is super loud. I have heard people say that you can lower your voice and start talking and the students will begin listening, but I have found that NOT to be the case. They just ignore me unless I use a loud sound of some sort. Years ago I lost my voice and I used a metal coffee can with a little water in it and banged on it with a metal ruler. That was a great attention-getter! I know of teachers who use bells, too, but I think that would just drive me to irritation. An elementary school teacher sees 1300 students in a two week span, and she has trouble with the noise level getting out of hand. How would you deal with that? Everyone I know at elementary has problems with noise level, they love to talk because they usually are not permitted to talk much in the classroom. First- the table arrangement sometimes contributes to noise. If the students are many, at one table then they want to talk at the same time to be heard. If you can divide the tables or separate the table so you only have 4 to a table and they are only permitted to talk to those who are at their table. Sometimes the tables are those that do not permit you to separate. I put on some music, no lyrics just notes. If you can not hear the music then students are too loud. If noise level gets too loud I would turn off the lights to get their attention. Lights out and back on also means 5 min. of silence. Try again, if level is too loud 5 more minutes of silence. The silence is golden:) to the teacher that is. Some schools use a red, yellow, green light. Put a green circle up when they come in the room. the yellow light is ignored. Whatever you use it must become a routine and do it over and over again until they are familiar with the rule. Also you might find out what the classroom teacher does and use that method since they are already use to it. Another idea: have Team tables and reward the quietest table for the class by letting them line up first, get a sticker for the day, some small reward. Works for the little ones not the older students as much." One more technique that I have tried successfully is to get the kids to repeat after me in the same soft voice, "I, insert name, will use this quiet, inside voice in the classroom." It's funny to hear how many of them will parrot, "insert name" instead of saying their names! After that reminder, the class usually will manage their own noise, ESPECIALLY when they know they are about to entire "SILENT ART!" I hear them shushing each other when groups get too loud. From working with 30 students in a class ,teaching a hand signal for silence the first 2 weeks of school has helped greatly. When children are starting to talk use hand signal to quiet them down . Keeping a calm voice and telling them to work quietly helps. Students love to start talking out when I'm giving lessons so I simply stop and wait. This has saved me so much time because the students begin to realize that they are wasting their art time and learn to raise their hands instead. An elementary teacher says, "My biggest concern as an art teacher is managing the noise level in my classroom. I especially have a hard time when my students are drawing something that is fairly difficult and they require more one-on-one instruction from me. They have a hard time with self control and waiting quietly until I can get around to looking at their work. I did try something recently, though, that really helped with this problem. We give out "Warrior Cards" at our school for good behavior. On Fridays, these cards are put in a drawing and the principal draws out several for a prize. I started choosing a monitor when my classes started getting really loud. The person I chose was way ahead of the rest of the class on their project so they could afford to miss some class time working. The monitor was told to give a colored sticker to the students who were working very quietly. At the end of the class, I told the students that the ones who had stickers would be placed in a drawing for a warrior card. At the end of class, I asked all of the ones who received stickers to stand up. Most of the time, it would be the whole class! I would draw a letter out of a basket that contained letters of the whole alphabet. If I happened to draw out the first letter of the student's first name, then that student or students would get a warrior card. If I had time, I may draw more than one time. Sometimes several students would get warrior cards. It seemed to be a big hit." My number one problem is students talking while they work. Over the years, it's been hard to decide how much to let students talk while they are making art. Many elementary students have trouble whispering and talk really loudly. I can't stand a loud, chaotic room, so I start off the semester strict. The first 5 to 6 classes, I don't let the kids talk, so that they know I mean business. I often use the classroom teacher's behavior charts and give checks for talking or I sit students out. I give students two chances and the third offense means they sit out for 10 minutes. (I am especially strict about talking during my lesson). As the semester goes on, I become less strict. I will set my timer and tell the kids they have 20 minutes of quiet time, "to get into the zone." Once the timer goes off they know that they can whisper. If they get too loud as a class, we will go back into quiet time after a couple warnings. The kids seem to do well with a shortened quiet time, if they know they will be allowed to talk eventually. Another idea I'd like to try is the quiet bell. While students are working if they get to loud, the teacher rings the bell. The whole class says, "quiet bell." The bell is rung one more time as a warning: "quiet bell." Finally, the class has quiet time for however many minutes. Also, talking is very effected by seating arrangement. I give assigned seats on the first day of school. I use the classroom teacher's seating plan or ask for the teacher's advice on where kids should or should not sit.